THE FINAL SINISTER CINEMA CATALOG IS IN THE MAIL! 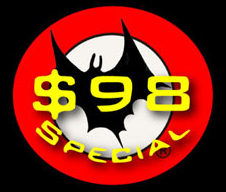 And The $98 SPECIAL has Returned for Perhaps the Last Time—Purchase any 12 DVD or Book Titles for Only $98 Postpaid!—see below right, or click on "Current Sales" above. Okay here’s the deal…our Final Sinister Cinema Catalog is now available. Let me explain what’s going on. As many of you know, I flirted with the idea of ending the annual Sinister Cinema catalog a couple of years ago. Sales had been way down in 2016 and Social Security yawned before me. But you guys responded to our opening message in the 2017-2018 catalog in grand fashion! It was a great show of support and we thank you again very, very much. However, this past year (2018) was a rough one and for the first time ever Sinister Cinema came close to actually losing money during the calendar year. And let’s face it, we’re nearly the last of the original mom-and-pop video companies that are still around. We started way back in 1984! 35 years…wow. I’m the first to admit that we are technologically behind the times (way behind!) and the prospect of taking on the expense of new avenues of video release (blu-ray, streaming, etc.) isn’t something we are willing to bear the financial burden of doing. So I’m retiring from the full time operation of Sinister Cinema and Armchair Fiction early next year. We are going to go through this year and the very beginning of next year just as we normally would. It will be kind of a farewell tour and give us time to say thank you to all of you who have supported us over the years. I’ll try to make myself available for phone calls, and your emails and letters are always welcome. Yes…we’ll have one last go-round of Drive-in Double Features in June. Then we’ll have our normal batch of annual new releases in October. Our usual flyers will be mailed out on both occasions. Depending on the overall response, I might even sneak in one last flyer at the beginning of February, 2020. Questions? Email us at scinema@qwestoffice.net or call 541-773-6860. Thanks! We've got 24 Brand New Releases to pick from. 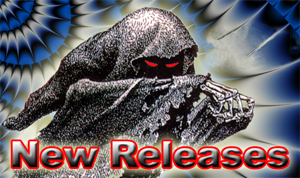 See links above and below to see All New Releases. There are 24 brand new titles and 46 other recent releases to feast your eyes on, inluding TENDER DRACULA (1974 with Peter Cushing), THE DEVIL'S BED (1978, Widescreen), FOUR HOURS OF TERROR (1958), A BUCKET OF BLOOD (1934), JOURNEY TO THE MOON (1959), SLEEP OF DEATH (1980), MIGHTY JACK (1968) and numerous others. All of these and more are listed in THE LAST SINISTER CINEMA CATALOG, which will be in your mailbox soon! Thanks for all your support as we enter into Sinister Cinema's final fulltime year of operation (now through February, 2020). Thanks Again!. We've also got 22 new and recent Armchair Fiction titles, including 2 new Horror Gems Collections. 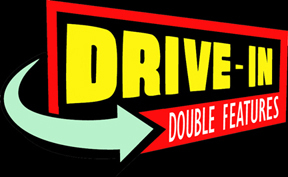 TWELVE RECENT DRIVE-IN DOUBLE COMBOS ON DVD! Buy Any 12 DVD or book titles for only $98 Postpaid! Our most popular sale is back for perhaps its last go round, so take advantage of these Great Savings. It's a new Batch, including an additional two new Horror Gems Collections, featuring the best of Weird Tales, as well as five new Mammoth Mystery Doubles, all well over 400 pages and featuring classic works by Agatha Christie, Edgar Wallace, Mary Roberts Rinehart, and others. Also 10 Recent Lost World-Lost Race Novels; 2 Recent Sci-Fi & Horror Gems Collections; and 3 Classic Science Fiction single novels. Most of these volumes are filled with wonderful original illustrations. Check out these new titles, which offer up some great novels and short stories by the likes of A. Merritt, John W. Campbell, Ray Bradbury, Isaac Asimov, Robert Bloch, William Hope HodgsonDwight V. Swain, and many others.